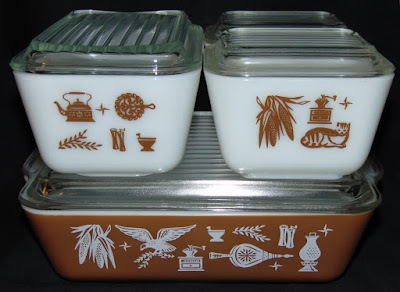 Most of us that collect anything even remotely connected to Corning Glass Works are familiar with some of the Pyrex patterns. 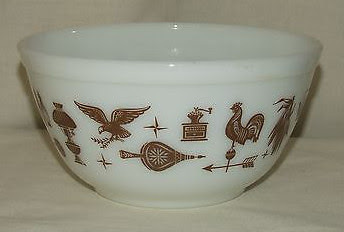 Early American Pyrex Ware, in it's lovely shades of Brown, White and sometimes Gold was a fairly common pattern in it's day. (1962-1971). 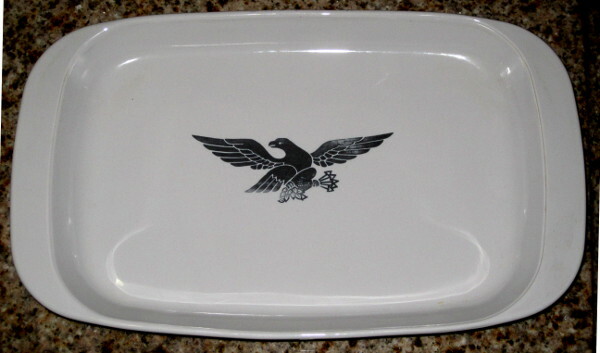 There was, however, another Corning product by the same name, though not nearly as common nor well known. 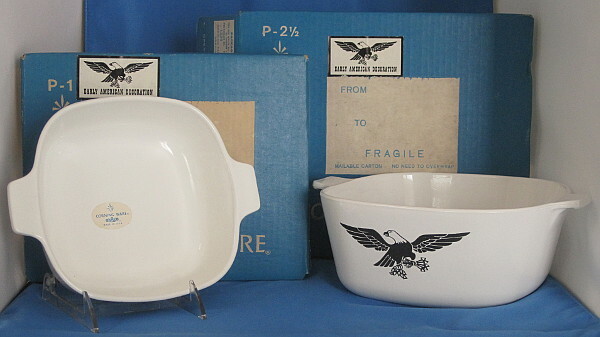 Corning Ware also came in an Early American pattern. Granted a much simpler pattern, featuring a lone bald eagle in black, and devoid of superfluous accoutrements like weather vanes, cats, coffee grinders, bellows, kerosene lamps and ears of corn. Very little is known about this pattern, but thankfully some of the original boxes have shown up, so the correct name has been verified. All the pieces seem to be unmarked, however, the saucepans have P-series handle lugs, so production was prior to 1972. 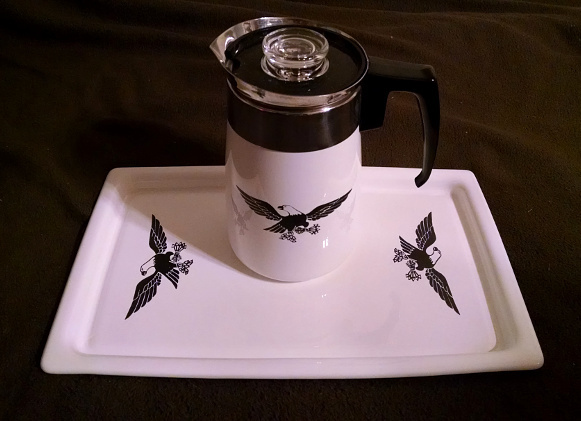 The fact that there are 2 percolators in this pattern (P-119 and P-116) suggests that date should be lowered from 1972 to 1970, because Corning discontinued the P-119 in lieu of the P-149, which made it's debut in the Renaissance Limited Edition Gift Line from 1970. Recent developments have also revealed the existence of a P-23-EP (1st generation Electromatic Percolator)... Since these were discontinued in favor of the P-80-EP model in 1966, this firmly places this pattern to a 1962-1966 production window. Whether it was a test pattern or not remains a mystery. You are my hero!! Thank you for taking the time and energy to put this site together.